Bangui-M'poko International Airport is the largest airport in the Central African Republic (C.A.R.). 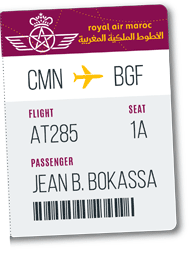 Its international code (IATA Code) is BGF (OACI : FEFF). This is the one on your luggage labels when you take a flight to C.A.R.. The airport area covers about 6 km² and a rectangular perimeter of 12 km at an average altitude of 368 meters (1208 feet). The unique runway of Bangui M'poko Int. Airport is oriented north-south and measures almost 2600 meters. It will soon be extended to 3200 meters and will allow larger aircraft to land and take off. 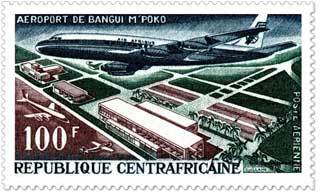 Between 1964 and 1967, shortly after the independence of the country, the first infrastructures of Bangui-M'poko Airport were built. Today, Bangui-M'poko Airport is of crucial interest to all Central Africa countries as it is the only international airport within a 1200km radius, the closest being the Yaounde secondary airport in Cameroon. Its cargo and passenger frequentation has continued to grow over the past 30 years with a brief interlude during the recent political events that have plunged the Republic into mourning. Its location and accessibility (see map) make it one of the economic hubs of the capital of the Central African Republic. The reception of travelers at departure and arrival make it a pleasant airport. Accessible sanitary facilities, shops, parkings and bar allow passengers to wait for their flight in the best conditions. With a flight punctuality of more than 94% (1st half of 2017), Bangui-M'poko International Airport guarantees you a pleasant experience.